The Blue Catfish is loved by sport fishers and aquarist a like and even if most people think about this fish primarily as a sport fish they are much more then that. Blue Catfish is a not to uncommon aquarium fish among those fortunate enough to have an aquarium large enough to host this huge catfish. Blue Catfish are also a commercial important species in many areas and are considered a delicates. Blue Catfish can grow to be 5.5ft /1.7 meter long and can reach a weight of 100 lb / 45 kg. There is however reports of even larger specimens of Blue Catfish caught during the 1800s when there reportedly was a 150lb / 68 kg heavy Blue Catfish caught. These reports are unconfirmed but can very well be true since large Blue Catfish are becoming increasingly rare just like most other huge catfish species. However most Blue Catfish never grow to these sizes and about 60 cm/ 2ft can be said to be an average size for adult Blue Catfish. Blue Catfish are found in rivers on the Atlantic side of the US as well as in Mexico and northern Guatemala. Blue Catfish has been introduced as a game fish in a large number of waters. They are usually found in deep water and prefer moving waters. They can sometime be found in brackish water. They are usually found in clear water and Blue Catfish are often found over sandy to rocky bottoms and more seldom in areas with muddier bottom substrate. If you want to keep Blue Catfish in aquariums you will have to try to mimic these conditions. Blue Catfish are however hardy fish and will survive even if the environment you offer them are less then optimal. They need to be kept in a very large aquarium or pond due to their very large size and are best kept in an aquarium/pond with a water temperature of 25-28°C/ 77-82°F. The aquarium/pond should be decorated with large rocks and a bottom covered with sand and gravel. Blue Catfish will appreciate if the aquarium/pond are decorated in such away that there are hiding places that are large enough for the catfish to hide in. Plants are not necessary. Use a large filter to provide the catfish with enough water moment. Blue Catfish are usually easy to feed in aquariums since they will accept fish meat, shrimp, crab meat and molluscs (with or without training). In the wild Blue Catfish live on a diet of invertebrates, fish, molluscs and frogs. 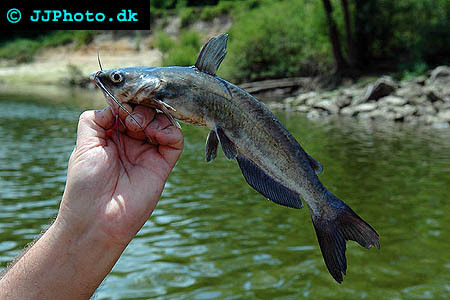 Blue Catfish appreciate to be feed feeder fish every now and again. Their predatory nature means that they shouldn’t be kept with any fish that are small enough to be dinner. A Blue Catfish can live to be at least 25 years old and perhaps even older. A higher maximum age would not be surprising since many catfish can grow to be very old. So old that there actually might be some truth to the myth about the monster catfish that has eluded capture by the son, father and grandfather. There is little information available about breeding Blue Catfish in aquariums but it is possible to do so in larger ponds. In the wild they span in April to June. They build nest in which the Blue Catfish lay their eggs and later guards them from predators until the young catfish hatch. Blue Catfish are very productive and a large female can lay up to 200 000 eggs and perhaps even more than that. They usually wander into more placid water before building their nest and spawning.